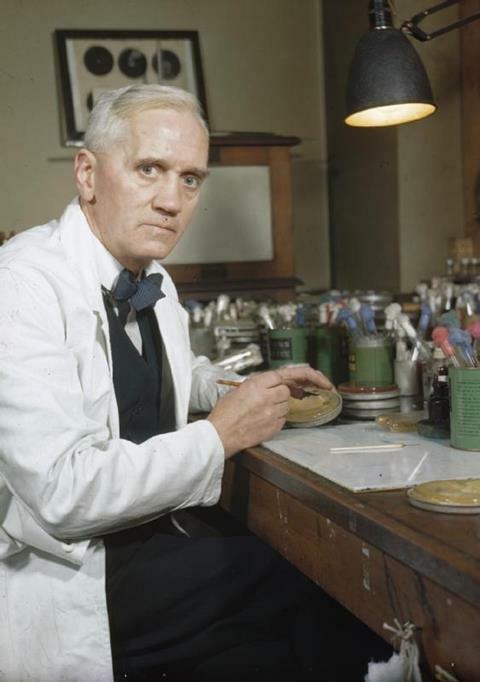 Professor Alexander Fleming, holder of the Chair of Bacteriology at London University, who first discovered the mould Penicillin Notatum. Here in his laboratory at St Mary's, Paddington, London. 10 million soldiers died in the first world war, about two thirds of them on the field of battle. The rest of the deaths were due to diseases post-conflict, and many of those were caused by the bacterial infection of wounds. In October 1914, just two months after the outbreak of war, the director general of the British Army Medical Service said: 'We have in this war gone straight back to all the septic infections of the Middle Ages'. 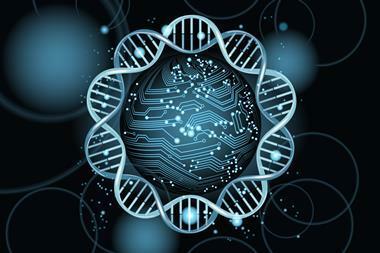 Many doctors and scientists who survived the battlefields remembered this and it inspired their subsequent researches. One of these was a Scot who served in the Royal Army Medical Corps of the British Army. His name was Alexander Fleming. When Fleming went back to St Mary's Hospital in Paddington after the war, he continued to study bacterial infections. 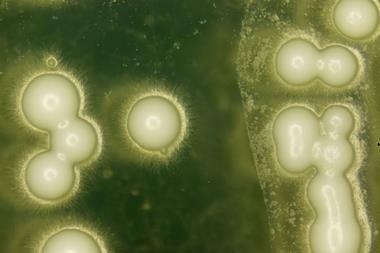 In 1928, he was studying staphylococcal infection, attempting to grow the bacteria on nutrient agar in Petri dishes. One day he noticed that in one dish a mould had appeared and that the surrounding colonies of staphylococci had been destroyed. Fleming identified the fungal mould as being from the Penicillium genus, and others later found that the mould was Penicillium notatum. Fleming studied a filtrate from the mould growth, finding out that it killed a number of infections, and some time later called the filtrate penicillin. He published his findings in 1929, but did not seek to apply it clinically. People thought that penicillin was too unstable to be of use. In 1935, the University of Oxford appointed a new professor of pathology. His name was Howard Florey. Florey wanted to recruit someone to supply biochemical expertise to his department and chose the German born Ernst Boris Chain, who had left Germany in 1933 when Hitler came to power. Looking for antibacterial agents, they started working on penicillin in 1938 and the following year, just as another World War was about to break out, they started to scale up production. A fourth scientist, Norman Heatley, solved the technical problems involved in building a pilot plant for the manufacture of penicillin, famously bringing together an assembly of bedpans, milk churns and baths. But it worked, and in 1940 the Oxford team discovered that their penicillin cured mice of lethal streptococcal infections, and then carried out successful tests on humans. But they only had enough penicillin to treat a handful of patients. Wartime Britain was no place to produce large quantities of penicillin, so in 1941 Florey and Heatley crossed the Atlantic to study North American practices. Heatley was to remain at the Northern Regional Research Laboratory in Peoria, Illinois, for over four months, where several improvements in the process were developed, such as using corn steep liquor in place of yeast, and lactose in place of glucose. 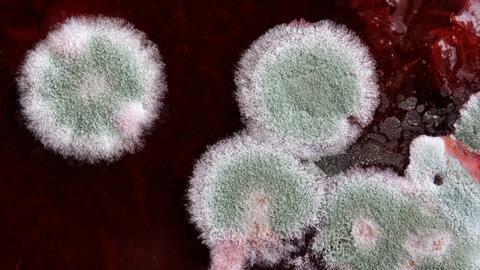 A mouldy cantaloupe melon provided a strain of Penicillium chrysogenum that improved yields, while scientists also found that adding different chemicals to the liquor gave rise to different penicillins; in particular, adding phenylacetic acid to the brew, proved an excellent source of what became known as penicillin G, benzylpenicillin. Mass production ensued, and penicillin was available in large quantities in 1944 to treat the wounded following D-Day. 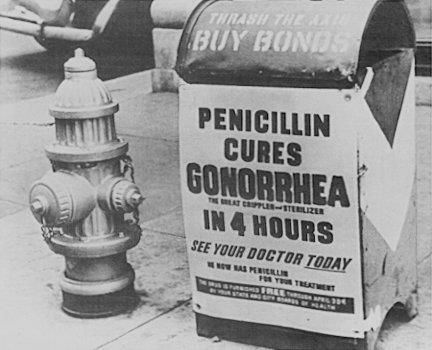 A poster attached to a curbside mailbox offering advice to World War II servicemen: Penicillin cures gonorrhea in 4 hours. 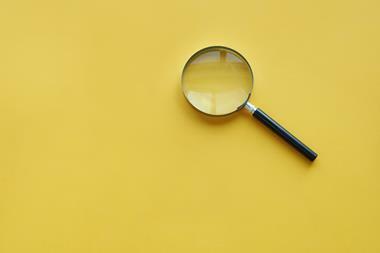 Although the components of penicillin were known to be carbon, hydrogen oxygen, nitrogen and sulphur, all this time its structure remained unknown. Finally in 1945 the Oxford crystallographer Dorothy Hodgkin determined the structure of penicillin G. To the surprise of most scientists, it contained a four-membered beta lactam ring, which gave a clue to how penicillin works. As any chemistry student can tell you, a four-membered ring is highly strained and therefore unstable and very reactive. The beta lactam ring binds to the enzyme peptoglycan transpeptidase, which the bacterium uses to make cell walls. With the enzyme inactive, the bacteria grow bigger but cannot divide, and eventually burst. Animal cells do not have cell walls, so we do not have peptoglycan transpeptidase and thus penicillin is not toxic to humans. However, penicillin's victory over bacteria was short lived. From the moment antibiotics were first used, bacteria began to appear that were resistant to them. In 1946, a year after the widespread use of penicillin, several strains of Staphylococcus aureus had already become resistant to it. Because bacteria adapt quickly, mutations soon emerged that changed the enzyme peptoglycan transpeptidase so that penicillin cannot bind to it. Other bacteria can make another enzyme, penicillinase, that catalyses the hydrolysis of the beta lactam ring, destroying the activity of the penicillin. 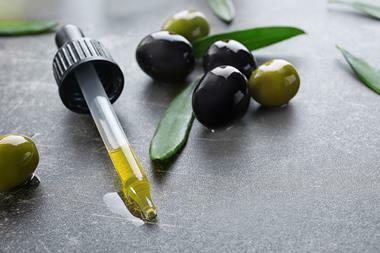 So scientists have had to find ways of protecting penicillin and of making penicillins with a wider range of activity, as well as developing new antibiotics. 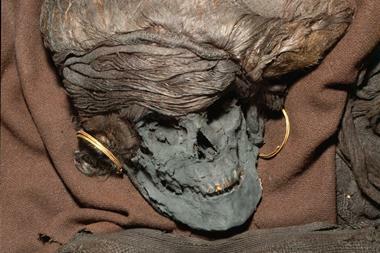 But just as they do so, the bacteria continue to adapt. Methicillin-resistant Staphylococcus aureus, better known as MRSA, is immune to the majority of antibiotic treatments and the problem of bacterial resistance is now one of the major challenges facing scientists. But let us remember those pioneering scientists who first brought the world this weapon against infection and disease - Fleming, Florey and Chain - without forgetting all the other scientists involved - especially Norman Heatley. Although we take penicillins for granted, these amazing molecules have saved untold lives. Indeed, as despite this resistance, this compound changed the course of medicine in the fight against infection. 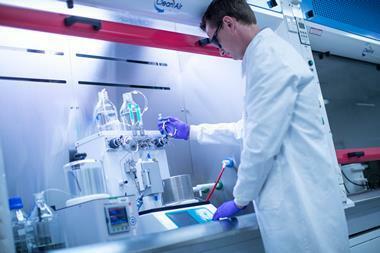 That was Birmingham University's Simon Cotton with the antibacterial chemitry of penicillin. Now, next week: we head up into the atmosphere. For most people, ozone is associated with a hole in the atmosphere, and thoughts of environmental damage. But the important properties of ozone that make that hole so very important, and the chemistry behind the hole, are perhaps less well known. Ozone is an allotrope of oxygen. Allotropes are different forms of the same element, for example diamond and graphite are allotropes of carbon. The oxygen in air is made up of two oxygen atoms bonded together, and is formally called dioxygen. Ozone is dioxygen's slightly bigger sibling, being comprised of three oxygen atoms. For such a small molecule so closely related to dioxygen, the chemical composition of ozone perplexed 19th century chemists for many years. And to find out the chemistry of this comound, that these scientists have since discovered, and its role in our environment, join David Lindsay in next week's Chemistry in it's element. Until then, thank you for listening. I'm Meera Senthilingam.